See the 'Staff' page for the full list of teaching and support staff. We make use of a text alert service to inform parents of late changes to schedules and other urgent messages. Please ensure that we have your up to date mobile numbers. If parents would like a paper copy of the information on our website this can be provided free of charge. The village of Wanborough is just to the east of Swindon, on the edge of the Lambourn Downs. Wanborough has a long history, the High Street follows the line of a Roman Road, and the even more ancient 'Ridgeway' passes nearby. 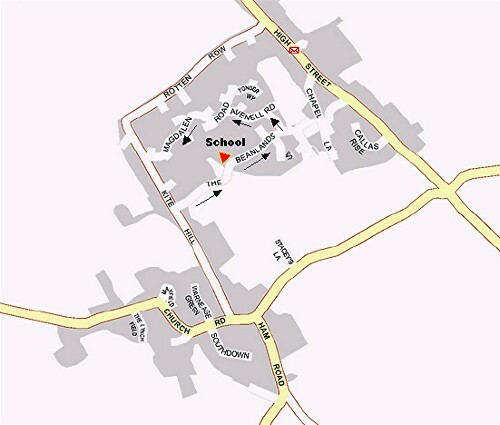 The School is situated on 'The Beanlands', in the centre of the newer housing area of the village, between the older 'Upper' and 'Lower' Wanborough. The school supports the Walk to School initiative and has produced a map of walking routes around centre of Wanborough as well as a 5 minute walking routes map. This is available from the school office. If your journey is too far to walk, for safety and to reduce congestion, we ask parents to observe an informal 'one-way' system, as indicated above, and to keep their speed down to 20mph. The School car park is for staff and school bus use only, unless the school has given special permission. Please park responsibly around the school, do not park in the areas designated with solid white lines and marked 'Keep Clear' or across local residents' driveways. Cyclists using the cycle sheds must dismount as they enter the school gates (on the right of the vehicle access). Pedestrians should use the path to the left of the gate.